Cinco and Jupiter are a little depressed. All of our transient neighbors have sailed off to warmer locations. This year we had a great group of transients with very good taste (two of them owned Mason sail boats). I provided the neighbors lots of dog treats so they could make friends with the boys. 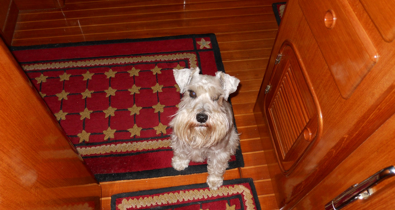 Also taught them about schnauzer’s love of broccoli stems. As a result, Cinco and Jupiter were regularly provide little bits of goodies on the way to and from our walks. For several days, they stopped at each finger pier to look for friends with treats! Now that hurricane season is gone, so are all the neighbors. We are the lone boat on the pier until we move to the floating docks for winter. It is very quite and peaceful. Can’t wait for the bufflehead and canvasback ducks to return. The water is starting to get cold. I went sailing with friends last weekend. The sun was shining and it was warm out, but when we got into the Bay the temps dropped drastically as the water is in the lower 50s F.
I have to pull out the decorations for Christmas this weekend and get the boat ready for the holiday.